Our loving Father wants us to enjoy long life, divine health and healing. His desires are communicated throughout the scriptures. God does not only assure us of His presence but His protection, peace, provision and power to overcome. God’s supernatural protection is demonstrated throughout the Bible. In the Psalms, David repeatedly reminds us of God’s protection, not only on his life but on the whole nation of Israel. The book of Daniel in the Bible also gives us a glimpse of how far God can go to protect His people. It is no problem for Him to quench a fiery furnace or to shut the mouth of a ferocious lion. He has proved time and again that He is able and willing to deliver us no matter what the circumstances. He gave His only begotten Son, Jesus Christ to protect us not only from eternal destruction but also from internal and external forces here on earth! Health is one of the most precious assets we have from God. We should treasure it and nurture it. Good health is part of salvation. Every child of God should enjoy it. We call it divine health, complete wholeness; spiritual, emotional, mental and physical well being. Unfortunately, most of us are not experiencing the full benefits of our salvation. We should always remember that protecting our health leads to preventing and minimizing disease. Eating healthy is one of the best and most important decisions we can ever make. Every end of the year or beginning, most people make new goals like: lose weight, spend more time with family, buy a new car, save money, go for vacation to … and etc. Whereas all these may be important, if you are not healthy they may be difficult to achieve. Healthy eating helps us to get the right nourishment from the food we put into our bodies, a balance of vitamins, minerals, live enzymes, antioxidants, essential fats, proteins and carbohydrates. And we can get all these from the food we eat if we make the right choices. Do you know that eating healthy is cheaper than eating whatever you lay your hands on, in the long run? When we eat healthy we do not spend so much money buying so many supplements, most of which we don’t even utilize? Most of the supplements purchased end up in the cupboards and not in the body. Furthermore, healthy eating boosts our immune system and keeps us healthy. I have been amazed by the number of people who spend money on fresh food only to store it in the fridge and then go buy fast foods? This is a fact. I have witnessed this repeatedly. Food being thrown away (especially vegetables) after going bad is a common practice. What a waste! What makes healthy eating so difficult? Unwillingness to change is one of the common causes but we also tend to confuse healthy eating with dieting. Healthy eating is not going on a diet. It is changing your eating habits so that you may eat healthy while enjoying what you eat. Healthy eating does not mean deprivation. You can eat healthy and eat the healthy foods you like. As you set your goals for 2013 answer this question: Why do you want to eat better? Is it because you want to get healthier, feel better, look better, be a role model? Personally, I aspire to be as healthy as I can be, just for me or for my own good. And yet, as a healthy promoter, I consider what type of message I send to those I try to help. I feel that I have some responsibility towards my family and those I teach. Not that I am responsible for their choices but I have to be a good example and live what I teach. If you are a parent, it is no use telling your children to eat vegetables if you don’t, or to drnk lots of water when you are always drinking soda. Even if you are trying to lose weight your ultimate goal should be to become healthier. With that motive, you will be able to make healthy eating habits. And this will motivate your whole family. Although changing a habit is not easy, you can start by making small simple changes that you can stick to, for example; adding one more fruit a day, eating at least one salad a day, drinking an extra glass of water, and etc. You don’t have to change everything in a day. But you can work towards your goal a day at a time while you eliminate foods that do not promote good health. As you make your choices of the food to eat, remember to include a variety. Eating 5 small meals a day is recommended instead of the two to three large traditional meals. These should include lots of vegetables both lightly cooked, raw and salads, as well as fruits and water. The best carbohydrates come from whole grain unprocessed foods, fresh vegetables and fruits. Fish and white meats are preferred to red meats and legumes and pulses can play a big role here. Remember to eat some good quality fats like avocado, virgin olive oil. etc which supply omega 3. And if you crown it all with physical exercise, rest, quality sleep and a positive attitude, 2013 is going to be a very enjoyable year. Don’t forget to laugh as often as you can. Why is there so much buzz about wheat grass and other green juices these days? Actually the healthy benefits of wheat grass, other grasses and living foods have been documented for years. Ann Wigmore, who co-founded “Hippocrates Health Institute” in 1968, was a pioneer in the use of wheatgrass juice and living foods for detoxifying and healing the body. When my sister was going through chemotherapy between September and November 2012, we embarked on following Ann Wigmore’s discovery. Wheatgrass juice became the foundation of my sister’s diet. Due to the nature of the tumors in her esophagus and stomach, she could not swallow any solids and to make it worse even juices would not go down her throat. But by God’s grace wheatgrass juice managed to pass through. It was the first food she put down her throat when she got up and many times the last before she went to bed. I recall days when the main food in my sister’s body was wheatgrass juice. She was taking at least three shots (each shot = 2 ounces) of wheatgrass juice a day. Her consultant was quite amazed at her progress after the second cycle of chemotherapy. Once we learnt about her condition, we made a decision to supply her with live foods. But since she couldn’t eat, fresh wheatgrass juice became the main focus of the family. We tried to buy it but it was too expensive and even difficult to access. 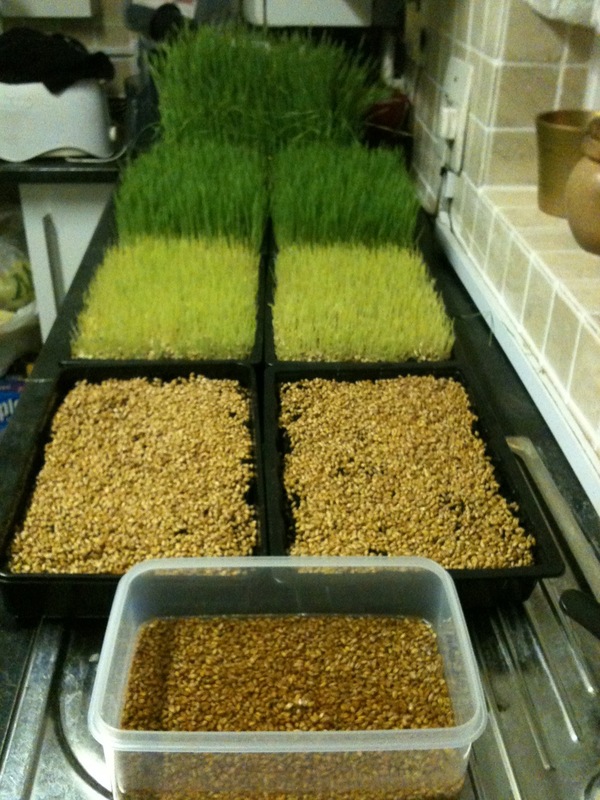 Cate’s son Daniel decided to start growing wheatgrass for his mom. And I must say, this was the best decision he could make at the time. We embraced it with every fiber of our being. We grew wheatgrass, consumed it and recommended it to others. Our home became a greenhouse as well as a clinic. After just a couple of weeks Cate could get the minimum needed fresh organic wheatgrass juice. And it wasn’t long before we were all drinking at least one shot of wheatgrass juice a day. In spite of the taste, we made a joint pact to drink it in order to support my sister so that she might stick with it. We did not want her to give up drinking wheatgrass juice at any stage. We know there are conflicting views about grass juices, we have read about them but in our experience wheatgrass juice was a life saver. Natural foods work in synergy to boost our health. God’s advice is that we make full use of the nourishing plant foods He created for our health. Vegetables, fruits, grasses, seeds, nuts and grains are great in their natural form, all nourishing and essential for health. As she got better and started swallowing, Cate began drinking other fresh juices. And eventually she started eating fruits, then salads and other health protecting foods. We thank God for doctors. Their contribution to health and life should never be taken for granted. Cate’s team of consultants was great and very supportive. We will always be grateful to them. Furthermore, science and technology, have also contributed to better health when used wisely. Yet we should always remember that, the foundation of health is the natural food which God so wisely created for our health and healing, particularly the plants foods. Cate could not depend on chemotherapy alone. In order to rebuild her immune system and fight the side effects of chemotherapy, she had to nourish her body with the most potent living foods she could swallow. Wheatgrass, with its high content of chlorophyll, oxygen and live enzymes, etc. became our first choice. Wheatgrass is an amazingly dense nutrient food with a remarkable collection of benefits. Drinking fresh wheatgrass juice (freshly juiced) will provide the best benefits as it contains live enzymes, oxygen, antioxidants, vitamins, minerals, phytonutrients, protein and more. Due to the fact that this fresh wheat grass juice is in its natural form, these nutrients are in their best form for the body’s use. The immediate impact of just 2 ounces of wheatgrass juice taken first thing in the morning was quite remarkable. When we started taking the morning shot we all noticed that we had more energy. Cravings for sugary or sweet foods decreased. And as time went by, our skin became smoother and supple, and the nails became stronger. Cate’s results were more obvious and more impressive as her skin and nails had been adversely affected by the side effects of chemo. She even noticed that she was more alert with mental energy which had been lacking before. We are so enthusiastic about wheatgrass juicing that we had to share our story. Wheatgrass juice played a major role in our sister’s recovery diet which helped her to fight chemotherapy side effects as well as to build her immune system. With the foundation of God’s Word, a combination of chemotherapy, quality sleep, rest, fresh wheatgrass juicing and healthy eating, my sister beat stage 4 esophagus cancer. coach handbags purses kathy on What are antioxidants? ray ban imitation of life on What are antioxidants? garage door spring deer park on What are antioxidants? louis vuitton handbags on What are antioxidants? don wilson fb ads cracked 2.0 reviews on What are antioxidants? Indian remy hair weave on What are antioxidants? Protection Is Better Than Cure on What are antioxidants? Dipu on What are antioxidants?